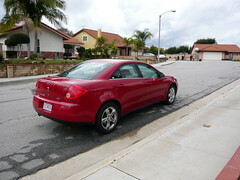 I am here at the City of Lost Angels and before I transfer to the S65 AMG , the Pontiac G6 is my ride in the interim. Got this car from Hertz at the airport. Hertz may be a tad pricier but the convenience is unsurpassed. Once I got out of the airport, I boarded the Hertz shuttle bus to their airport location which was around 5 minutes away. Given the I was already their #1 Club member, a car had already been assigned to me. All I had to do when I got off the shuttle bus was to look up my name on the big computer screen where it will tell me where my alloted car was parked. Without even entering the office to check in my reservation, I just lugged my bags to the designated car and drive off. Anyway, in case the name Pontiac doesn't ring a bell, it is an american make by General Motors. The Pontiac G6's more famous predeccessors would be that of the Pontiac FireBird and the Trans Am, of which the latter was immortalised when they featured it as KITT in Knight Rider. Somehow, I am starting to get a knack of getting red cars. If you remembered the last Mazda6, it was red as well. Strangely, the Mazda6 was a upgrade to the next category from my usual mid-size category but I feel that this Pontiac G6 despite no upgrade was the better car. Despite the fact that it felt heavier, the car's 3,500cc V6 engine made the car very lively. My only gripe was that the Continental tyres, despite being relatively new have a tendency to lose traction, especially when I accelerated from a red light. Fortunately, the traction control system would kick in albeit, unnecessary under normal driving conditions. Body wise, the form factor looked just as good as the Mazda6 but the shell felt just as thin. Somehow, the pre-conception of Japanese cars being aluminum soda cans on wheels no long applies. 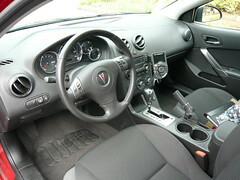 The interior for both the Pontiac G6 and the Mazda6 were just as plasticky but the former wins hands down with nice panels and layout. 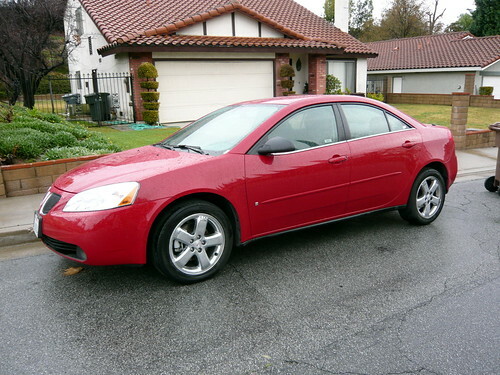 In all, I think Pontiac G6 is a better car among the two. However, given that it has a more powerful engine, the gas mileage may not be as good.